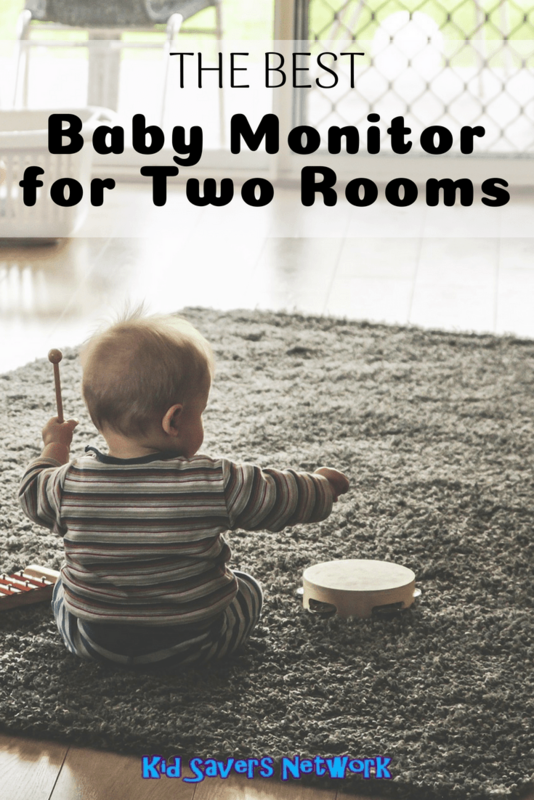 If you have a growing family, a baby monitor for two rooms is a great idea. However, most baby monitors on the market are targeted at just one room. There’s also various functions and configurations so it can all get a bit confusing. Added to the fact that certain models will work great for some parents and others hate them! We hope our reviews of the best multi-room cameras can help. Whether you need a baby monitor for twins, or for your toddler and infant you’ll find it on the list below! What does a Baby Monitor for Two Rooms Need? 11. Tilt, Pan & Zoom! 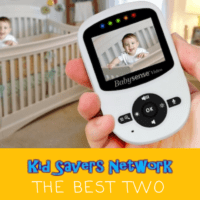 Let’s check 12 important features a baby monitor for two rooms (or more!) should have. Buying a long range baby monitor is definitely preferable. A larger home or one with thick walls can really cause problems with the signal.. The best video baby monitors have a long range up to 1,000 feet. Digital baby monitors are more expensive than analog but you should receive a better sound quality with digital. It also makes them more secure as analog is basically a radio wave that anybody can listen in on. Digital can also help prevent a hacked baby monitor as often no WiFi is needed. For increased security, monitors with DECT technology that encodes and encrypts data from the transmitter to the receiver. DECT also helps cut-out interference from other appliances such as phones, tablets, and even microwaves. If you’re familiar with digital camera technology then you’ll know that picture quality deteriorates at night. It’s important for video monitors to have high-quality night vision. Multiple receivers are a great idea if you want to have one fixed in a room and carry the other when you move around. It also lets somebody else share the baby-monitoring duties, too. 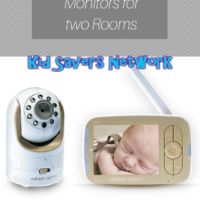 Some of the best multi-room baby monitors have a “split screen” function. This allows you to monitor two rooms or two cameras in one room at the same time. Check also how the split-screen works. Sometimes it’s on a 5-second cycle. The best monitor systems will be sound activated and can immediately show you the relevant feed. The best battery-powered monitors have power saving modes that will turn off the video screen if there is no activity. They also automatically switch back on when required. When you’re physically in another room you can’t feel if the temperature is just right for your little one. Having a room temperature display is a nice optional extra that many parents appreciate. It could even save your baby’s life as we discuss here. Some of the baby monitors have blinking lights to alert you of activity in the nursery. This comes in really handy if you’re doing the vacuuming or your partner’s got the game on too loud. The best video monitors all have a tilt, pan and zoom feature. If you’re like me, you’ll want to take a close check on them when they’re sleeping. Also, once they got older or if you have twins, you’ll really appreciate being able to pan around the nursery. The Best video monitors of 2019 all have displays larger than 3″. This is essential when you have split screen baby monitors with 2 or 4 cameras!. 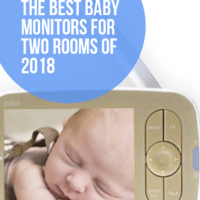 Whether you’re looking for the best baby monitor for twins, or one for two rooms, you’ll be sure to find it in our list below. Parents of twins and babies around the same age love this baby monitor from Infant Optics. The DRX-8 features interchangeable lenses – technology that is becoming more popular with smart phones. There’s three lenses – normal, zoom (both included) and a wide-angle lens (sold separately). This allows you to customize the camera to your nursery and room. The zoom lens is great for newborns who tend to sleep a lot and a wider angle for when they start to move about more (around 4 – 6 months). The basic kit comes with just one camera, but you can add-on up to 3 extra cameras. In addition to the different lenses, this monitor has a tilt, pan and zoom option too so it’s great for active babies. A lot of baby monitors have problems with battery usage. The DRX-8 has some handy features to help you save batteries and ensure it’s always on. The battery life is an impressive 6 hours with video feed – increased to 10 if you go into “Power Saving” mode. By pressing a button you can choose to go “Audio Only” and this will reduce battery usage by 50%. There’s also an audio alarm if the batteries are running low. Infant Optics have listened to customer feedback and you can now turn off the beeping as well. Two chargers are included – which is great when using dual cameras. There’s even a USB charger which can add another charging point in your home. The range of this model is given as 700 feet “line of sight”. Naturally, this will also depend on how many walls the signal has to go through and how thick they are. There’s an “Out of range” alarm so my advice is to check the perimeter after you receive the baby monitor. Another feature I really like is the 2-way talk. Our toddler is a bit clingy and we have problems putting him into his own room (and staying there!). Being able to talk with him helps reassure him and let him know we haven’t abandoned him! The sound on this particular model is great as well. It’ll pick up sounds like your baby sucking their thumb or the hum of an air purifier on even the lowest settings. If you’re looking for a customizable video baby monitor that you can extend to up to 4 cameras, it’s hard to beat the Infant Optics DRX-8. The system only ships with one camera, so be sure to also add the Infant Optics DRX-8 Add-On Camera. 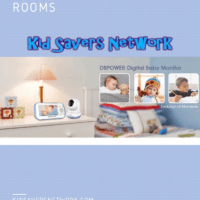 The DBPower Digital Baby Monitor is a great value with a lot of features. Two-Way communication: This allows you not only to hear what’s going on with the baby, but it also allows you to communicate with your little one. It’s a god send especially when you’re in bed trying to sleep. Parent’s also enjoy using it as a two-way intercom, being able to pass on reminders or tips to the parent tending to the baby. Automatic Night Vision: A hands-free approach to always getting the best streaming video from your baby. The cameras automatically detect night-time lighting and switch into night vision mode. It provides up to 15 feet of visibility in complete darkness. This wireless baby monitor system only ships with a single camera, but it’s expandable to support up to 4 cameras. An additional DBPower Add-On camera turns the system into a dual baby monitor. It isn’t available yet, but the manufacturer should be shipping soon. The parent unit monitor display is 4.3”, not as large as some of the others that go up to 5” in size, but it does provide high 640×480 resolution. As with any top-of-the line camera system, the DBPower uses cameras that can remote pan tilt, and zoom. Super helpful if you have a little one like we do that always ends up in a different spot in their crib. When you add-on additional cameras, some really great features are “Split-screen” where you can see multiple cameras on one screen. As well as auto-scanning, whereby the parent unit display automatically scans between all your cameras. One of the fun features is the DVR function. If you have a separate memory card (up to 32GB TF card), it can do an automatic recording triggered by sound. That way you won’t miss any adorable things your baby does in their sleep. It’s like getting an automatic baby video created for you. Yes, the DBPower does support audio when there are multiple cameras connected. You’ll have to use the display in “auto-scan mode” for audio to work. The other option, is to use Split-Screen Mode, but in that mode the audio won’t work, it replaces audio noises with a “Cam” blinking and volume alert. Remote temperature sensor is accurate! No ability to disable video on the display. Many parents like this ability to save battery power when sleeping. The VTech VM343-2 is a digital video baby monitor set that ships with 2 cameras. Nothing further needed if all you need is 2 cameras. The system does support up to 4 cameras using the Vtech VM305 Add-On Camera. The display supports Split Screen as well as auto-scan. In Split Screen mode, you lose audio, but there will be an alert on the screen when noise is detected on one of the cameras. In auto-scan mode, you will retain both video and audio. The system has long range, up to 1,000 feet for secure video and audio transmission. It’s also been reported that range has not been a common issue with this baby video monitor. It has a two-way communication feature. Many parents love this as they’re able to soothe their baby as they walk to the room. High resolution 4.3 color LCD screen- never miss your babys smile and zoom to keep up with your little cruiser as they move about. 9-level sound indicator on the parent unit allows you to visually monitor noise levels even when the unit is muted. Refer user manual for troubleshooting steps. Audio baby monitor: automatic screen deactivation. If sound activation is enabled, the screen will go dark within 50 seconds automatically to save power. It does have a rechargeable battery, but this feature does allow going longer between recharge cycles. The Summer Infant Wide View digital video baby monitor ships with one of the largest screen sizes in 2019, a 5” screen. It has a high resolution 5” color LCD display with black and white for night vision and comes with a rechargeable battery. This particular model ships with 2 cameras included in the SKU. Which is a virtual bargain, since many systems sell extra cameras upwards of $50! If you want to add 3 or more cameras, they are available as the Summer Infant Wide View 2.0 Add-On Camera. This digital video baby monitor does not use cameras that can pan and tilt. Some parent’s have experienced excessive noise when using pan or tilt, sometimes waking the baby. This model of Summer Infant chose a different technology to allow you to always have the baby in view of the camera. This model uses a wide angle lens, which in most cases, negates the need to have the pan and tilt function. Digital zoom: With a wide angle lens, this is a terrific feature to get a closer view of your baby. Night Vision: All cameras on this list support night vision, but the Summer Infant does a terrific job of it. Night light:the cameras have a soft glow nightlight as part of the camera base. Very nice touch. Parent’s also have remote control of the night light, allowing them to turn it off remotely. 4 Cameras: the system is expandable up to 4 total cameras. More are availabe here. Fewer moving parts than most other baby video monitors. This Babysense video baby monitor ships with 2 cameras for right around $100 making it a dual baby monitor system right out of the box. A terrific price for a 2 camera wireless baby monitor for those on a budget. You don’t get all the bells and whistles, but for some folks, this may be good enough. One of the areas lacking compared to more expensive competitors is instead of a 4.5” or 5” screen, this system ships with only a 2.4” parent unit display. Supports up to 4 cameras. The extras cameras can be bought here: Babysense Add-on Camera. Rich Features - Auto Infrared Night Vision, Room Temperature Monitoring with High/Low Temperature Alerts, Eco Mode Voice Activation, Sound Activated LED Indicators, Alarm/Timer Setting, 2x Digital Zoom with Digital Image Pan/Tilt option, Multi-Camera Expandability (up to four cameras), Lullabies, Manual Pan (360 degrees) & Tilt (60 degrees), Auto Scan View, Tabletop or Wall Mounting Options. Disable screen: To conserve power, you have the ability to disable the screen video, but retain the audio, turning the parent unit into an audio baby monitor. Does not have Split-Screen mode. To view multiple cameras you’ll have to use the auto-scan feature or manually switch between cameras. No motion detection, only sound. If your baby is moving but not making sound, the camera won’t trigger any alerts. Dedicated baby monitors come with a lot of baby specific features. An alternative that some parents are turning to are general purpose security cameras. A very popular one is the Nest Security Camera. Nest has indoor and outdoor security cameras. For the purposes of retrofitting one as a baby video monitor, let’s look at the indoor model. Every detail, 24/7: By default, the nest cam has a DVR function and saves all recordings to the Cloud. It’ll also record it in super detailed 1080p resolution, day and night. Alerts: you get alerts on your phone, with two-way communication. Wi-fi video remote monitoring: built to use a wi-fi, network anyone with access to the Nest system can check-in on the baby, even grandparents. No parent unit display. Requires a smartphone or tablet, and can only be used as wi-fi video. Overall, the Nest security camera is a decent baby video monitor. It’s pricey for what it provides as a baby monitor, but frankly, it’s designed to be an excellent security monitor and not a baby. DONT MISS A THING WITH NEST ALERTS: Whether the kids just came home from school or the dog has decided to eat those new pillows you just bought; the Nest Cam sees it all! Get alerts through your Nest App whenever the camera detects movement and activity. And the coolest part is that the Nest Cam can tell the difference between movement from say a hand getting into a cookie jar, and a person entering a room. Person Alerts and Activity Alerts can help keep your home safe even if you arent there. BE HEARD WITH NEST: Nest Cam Indoor has a built-in speaker and mic, so you can hear whats happening at home. Or tell the dog to get off the couch. SET IT UP ANYWHERE: The compact size of the Nest Cam makes installation a breeze. Nest Cam Indoors stand works in all kinds of homes, on all types of surfaces. Set it down on something flat, like a table or shelf. The Nest Cam has a built­-in magnet so you can stick it to something metallic. Use the removable wall plate to attach Nest Cam to a wall. Or you can unscrew the camera from the base and attach it to any standard tripod mount. THERES NO PLACE LIKE A NEST HOME: We love home. Its the best place in the world. But not everything inside our homes is lovable. Some things beep at us; fail without warning; keep us in the dark. There are things weve learned to ignore. We think these things should do more. Nest is focused on making simple, human, delightful things. Thats how were creating the thoughtful home: A home that takes care of the people inside it and the world around it. Our overall opinion, for 2019, is still the Infant Optics DRX-8. It’s a longtime favorite and has the best balance between features, longevity, simplicity, and overall performance. It doesn’t come a second camera, so be sure to add the Infant Optics Add-On DRX-8 Camera.